I've always liked listening to cassettes, but I hate that you have to place the cassette in a player. I just want to plug my headphones directly into the cassette. 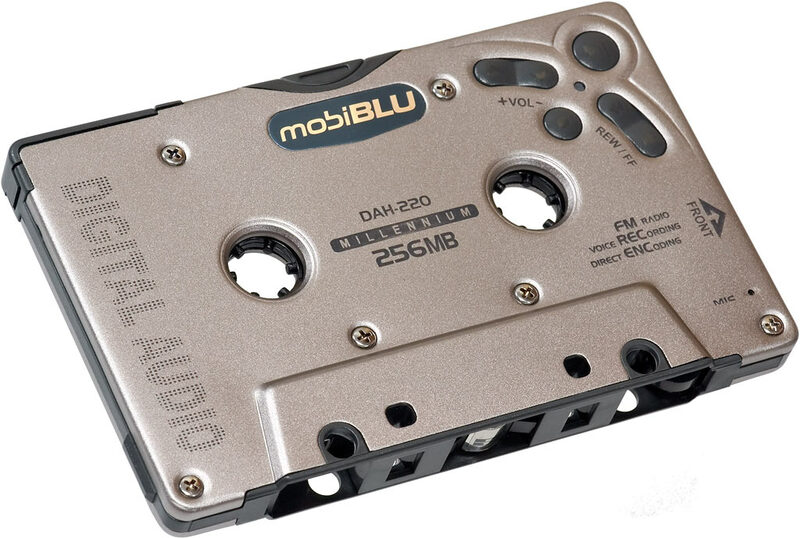 Now I can buy the Mobiblue DAH-220 and do that very thing. It's a portable mp3 player shaped like a cassette tape. Listen to it with headphones, or pop it in your tape deck and control it with the stereo controls. Ok, I don't think I would ever want one of these, but it is a cool idea. If you use Bloglines or something similar to watch for updates on this site, then you probably haven't seen anything for several days. But I have been updating. I made some changes to the brendoman.com robots.txt file to try and keep search engines from spidering the admin area of b2evolution. Little did I know that I was also blocking them from my RSS feeds. So, I basically told the Bloglines indexing bot to go away and never come back. It took a couple of days to catch my mistake and a couple of days after that for the bot to come back, but all is well again. William Bush still owns over two million dollars worth of stock in Engineered Support Systems Inc. The company claims that having Bush on the board hasn't helped them get any of its lucrative no-bid contracts. Even if that's true, it's worth noting that that a close relative of the president is making a huge profit off of the war that Bush conducted. I've been watching for an open source solution for doing backups in Windows. I haven't tried it yet, but it looks like Abakt might fit the bill. Here's a screenshot, and here is the manual. Can you recognize a phishing email? Take this quiz and see if you can tell which emails are legitimate and which are phishing. I got an 80%. If you're using Firefox, make sure you upgrade to 1.0.1, which fixes a flaw that allows phishers to trick your browser into thinking it's at a real site. If you're using Internet Explorer, then you should also upgrade to Firefox 1.0.1. Scratch this off the short list of things I had to leave behind when I switched from Movable Type to B2evolution. I had a very nice MT plugin that let me post books that I was reading. It would create links to Amazon.com with more information about each book (or cd, movie, whatever). If someone clicked through and bought the item, I would get a few cents for referring them. B2evolution doesn't have a plugin like that, but I can include a second blog and post my links and images to it (which I have to build at associates.amazon.com). I've got three titles posted on the right. So, it's not quite as nice as the plugin, but it works. And I'm still working on it. I've been cleaning up some computers for people, getting rid of spyware and viruses. Here are the steps that I've taken to deal with malware problems without spending any money on software. These work well as preventative measures, too. Start the computer up (without being connected to the internet) and close any programs that will slow you down (such as MSN Messenger or any other junk that runs at startup for no good reason). Sometimes the computer will get really slow and freeze up in just a few minutes. I restart the computer and hit Ctrl + Alt + Delete, then go to the processes tab and end any processes that seem to be spyware. If you're not sure what something is, search for the process name on google. You'll usually get results that tell you if it's a good or bad process. Be careful. Now you're ready to connect to the internet. Broadband is highly recommended, as you'll be downloading several large files. Open Internet Explorer (or whatever browser you have) and go to GetFirefox.com. Download and install the Firefox web browser. Now, close Internet Explorer and use Firefox to browse the web and download the programs in the following steps. From now on, don't click on the big blue E. That's the door that most of your problems have come through. Leave it closed. Download and install Adaware. It's free and very easy to use. Once it's installed you can download the newest adware definitions and scan your computer. This takes a while. If your computer crashes before the scan finishes, then go back to step two, or skip this step and come back later. When the scan is finished it may have found dozens of pieces of adware. The most I've ever seen is around 700. Right click and choose 'Select all objects.' Click 'next' and Adaware will remove the offending malware. You may want to come back and do a full system scan later. Now download and install Spybot Search & Destroy, which is also free. Check for updates, scan your computer and have the bad stuff removed. This is very similar to Adaware, but it will catch a few things that Adaware doesn't get. Also, Spybot has a nice feature called Immunize, which prevents bad programs from even installing. Now let's check for viruses. Download and install AVG Free. Update, scan, remove. Just like before. Make sure you have all the latest security updates for Microsoft Windows. There should be a Windows Update icon in your start menu somewhere. If you can't find it, then you can open up Internet Explorer (just this once) and go to windowsupdate.microsoft.com. Download all the critical updates. This may take several passes and several reboots. That should clear up most of your problems. If it doesn't, then consult a professional. Maintenance. From now on you'll need to update and scan with Adaware, Spybot and AVG Free once every one or two weeks. Keep Windows updated and use Firefox instead of IE. If you get tired of this routine, then you could always consider switching to an operating system that doesn't have these problems.